After being overwhelmed in Jerusalem, where Jesus walked on his final days, I decided to take the day trip to Bethlehem. I found some brochures at the Tourist Center at the Jaffa Gate entrance and I almost book the trip with Abraham Hostel. But at 160 NIS (Php 2000 / USD 50), my friend said it’s very expensive because the bus tickets is 7 NIS per way and it takes 20 minutes. So guess what I did? Of course I took the local bus. It’s #21 at the bus station in east Jerusalem (near Damascus Gate). When the bus reached it’s final stop, it was in the middle of the highway. I was expecting to go down the center where the tourist information center and the Nativity Church were, but no. I asked the bus driver if we are anywhere near the center, he said he doesn’t know. Great. I was immediately bombarded by several taxi drivers offering to help or give tour. I responded with suspicion and distrust. I truly believe this is a good practice as a traveler, rather than being gullible and falling into tourist trap immediately. I wanted to get a guide anyway so I negotiated. He offered 50 nis per hour (down from 100 nis per hour). When I still wouldn’t give in, he said to just take the tour and if I don’t like it, I don’t have to pay. Impressed with his confidence, I took the offer. 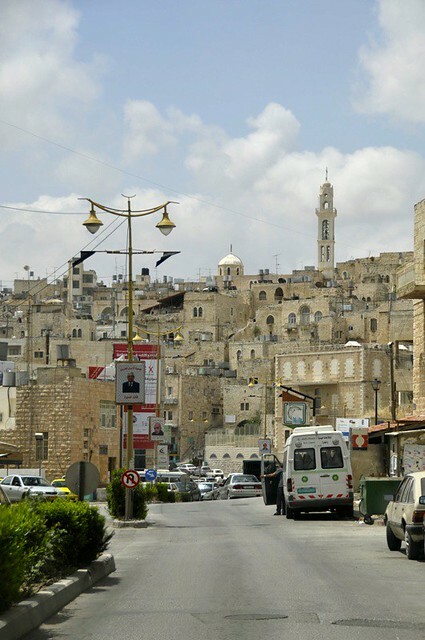 So how many of you (or us Filipinos) know that Bethlehem is a Palestinian Territory? I didn’t know before I came to Israel. I thought it too sensitive a topic to be discussing the whole Israel-Palestine issue with my Israeli friends, so I never did. So it was kind of interesting to be staying with the Spanish guys who work in the NGO in Jerusalem. I can ask questions without fear of hitting sensitive nerves. Riding the bus into the border, I remember musing how 2 days ago, hitching a ride with Shula (my host) to Jerusalem, she pointed the wall to me. And here now, I’m going in to the other side of the wall. I was very surprised to find West Bank to be normal. What was I expecting? Well, if I can be honest, blunt, and ignorant, then let me say that I thought people inside were dying, starving, killing, cramped and perhaps piling on top of each other because it was crowded? So there. I was blunt, ignorant, but honest. Seriously, it’s not possible to read and know everything in the world without being a psychic or genius. So yes, I was surprised to see normal houses, big houses, expensive cars, people in the stores making a living, driving a taxi, children playing, young couple flirting in the restaurant. My guide’s name is Josef and his English is quite good. I learned that he is a high school teacher and when school is out, he does sideline tour guiding with his taxi. In the course of the tour, he passed by his house, offered me tea and introduced me to his wife and children. He has 9 children, more than Father Abramam. I guess he needed the extra income. Yet again, I was reminded how we are all very similar despite our different backgrounds and situations. We’re all really just trying to make a better living and taking care of our love ones. Did I feel safe? I actually did although I was always aware and alert. In the end, I obviously paid more than the 160 NIS I was trying to avoid, but it was worth it as aside from the standard Nativity Church, Milk Grotto, and the Shepherd’s Field, I got to hear his stories. 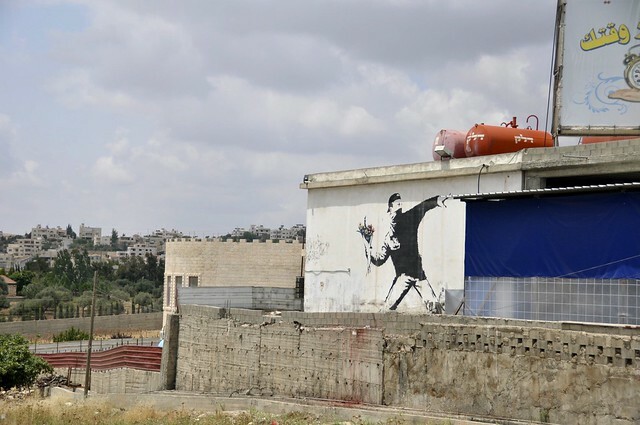 He also showed me some controversial spots in West Bank like the Banksy wall arts, as below. There are also other street arts you can find in photos gallery. He also took me to eat some really, really good food. Plus I had the taxi all to myself, not very environmental I agree. Anyway, if you are 3 or 4 friends, it would be perfect. I’ll end here for now. 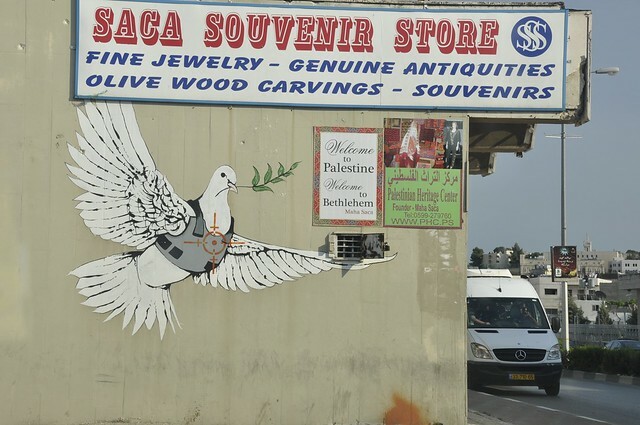 Don’t hold your breath but I’ll come back with part 2 of the more standard tourist sites in Bethlehem town. 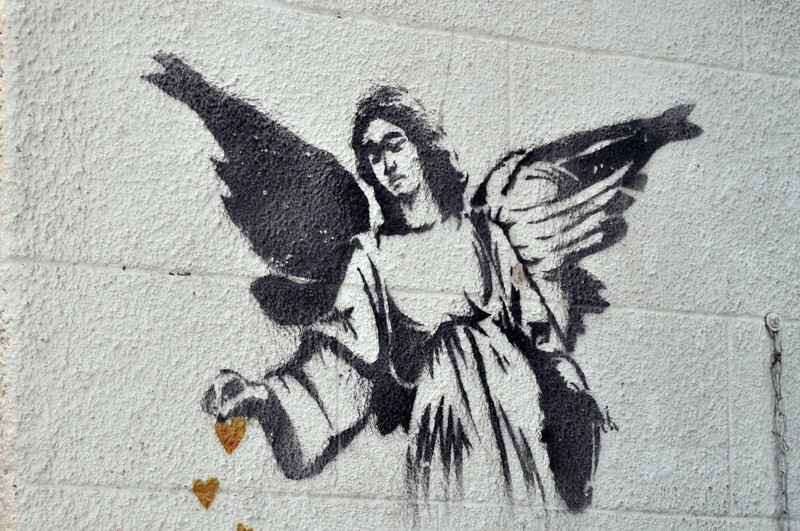 It’s interesting seeing Banksy’s work and pondering the lyrics “Oh little town of Bethlehem, how still we see the lie”. I like the juxtaposition of his images. I also had an interesting experience going to the West Bank by myself last year. My biggest mistake (which turned into a great story) was getting into the wrong line at the border when I was returning to Israel. I could have got in the “right” line aka the humanitarian workers line (which was apparently for foreigners in general) but instead I made a conscious decision to stay in line with the Palestinians because after three days in Bethlehem (and a day trip to Ramallah), I thought this small act of solidarity might mean something to them. It sure meant something to me. It is really interesting to hear your first impressions of Bethlehem, definitely different than the average man or woman might think. Sounds like a great tour even though it was a little pricy. To hear the stories from a local would be worth it to me. You are lucky! Back when I visited, i made it on my 2nd attempt. 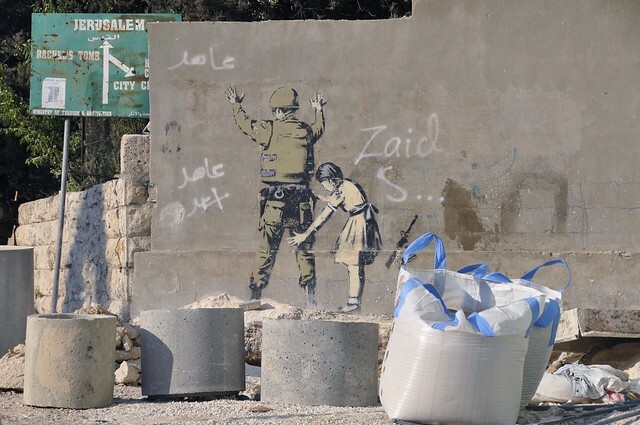 The Palestinian territory is sometimes closed off when there’s some “trouble” which of course, ain’t rare. Can’t wait for your 2nd installment. This I’ve to see for myself also. I know Israel and the contested Palestine territory only through CNN and BBC and i’ll also admit that the image I had was of violence, stone throwing, bombing, rocket launchers and chaos. Though, while both sides are in conflict with Israel wanting to hold on to the territory as they feel they deserve it after winning the Arab-Israeli war, and the Palestine wanting to get back their own land…I’m pretty sure stories of intimate human relationship and a simpe joyous living exist in both places, in the midst of a turbulent conflict.